A Rhode Island man is in custody after he shot and killed his mother yesterday at DHMC’s ICU. Lebanon Police said they received a call shortly before 1:30 pm on Tuesday regarding the shooting and DHMC issued a code silver (violent incident) to its staff. Sections of DHMC were evacuated, while other areas were on lockdown. Hanover schools and area businesses were on lock down for most of the afternoon. 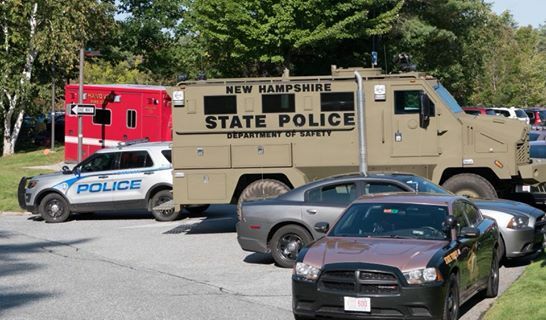 Lebanon, Hanover, Canaan, Plainfield, NH State Police, NH Major Crime Unit, The Bureau of Alcohol, Tobacco, Firearms, and Explosives Unit, along with Vermont State Police assisted on the scene for the search for a 48-year-old Travis Frink. Lebanon and Canaan Police officers took Frink into custody just before 3:00 PM as he was leaving the building. Attorney General Gordon MacDonald identified the victim as Frink’s 70-year-old mother, Pamela Ferriere, of Groton, New Hampshire. MacDonald stated that Fink’s visit to the hospital was to kill his mother and that more than one shot was fired. No other patients, visitor or staff were physically injured in the incident. The NH Attorney General continues to investigate the case but Travis Frink is expected to be arraigned today (Wednesday) through no charges were announced. Employees at Dartmouth were released shortly after 5:30 PM. Dr. Joanne Conroy, DHMC’s CEO and President will hold a Town Hall for staff on Wednesday from noon to 1:00 PM to discuss the next steps to recover from the traumatic event.